The sole prosecution is seen as a "terrible disappointment" by some of the families of the 13 people killed. They were shot dead at a civil rights march on 30 January 1972. The day became known as Bloody Sunday - one of the darkest days of the Northern Ireland Troubles. What next after Bloody Sunday charges? What happened on Bloody Sunday? The shootings led to widespread anger in Derry and further afield. Media captionWhat was Bloody Sunday? 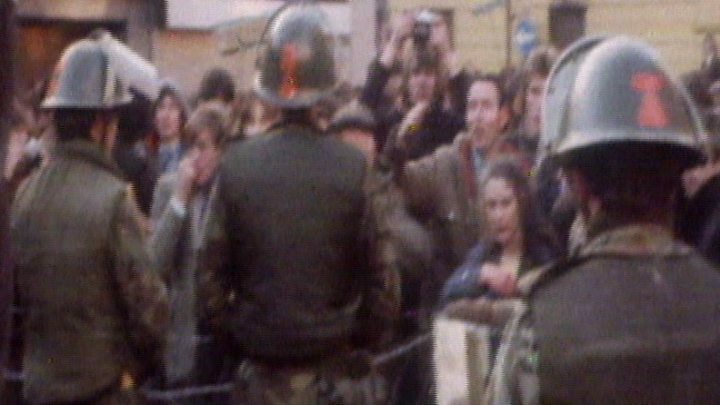 On the same day as the funerals were held for 11 of the Bloody Sunday victims, the British Embassy in Dublin was burned to the ground by an angry crowd. Soldier F also faces charges for the attempted murders of Patrick O'Donnell, Joseph Friel, Joe Mahon and Michael Quinn. BBC News NI's Home Affairs Correspondent Julian O'Neill said it could be a "period of months" before Soldier F makes his first court appearance. 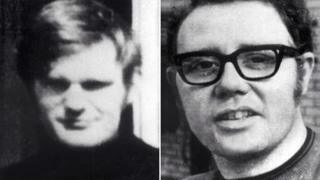 James Wray's brother Liam said he was "very saddened for the other families" of those killed on Bloody Sunday. "Their hearts must be broken," he said. "It has been a sad day but the Wray family are relieved." He added: "There are a lot of sad and heartbroken people today." Image caption A number of relatives of those killed walked to Derry city centre ahead of the PPS decision. William McKinney's brother Michael said it was "disappointing" for families who had not received news of prosecutions. Director of the PPS Stephen Herron said: "It has been a long road for the families... and today will be another extremely difficult day for many of them. "We wanted to meet them personally to explain the decisions taken and to help them understand the reasons." Linda Nash, whose brother William was shot dead, said she feels "let down by a law and a justice system that's supposed to protect people". 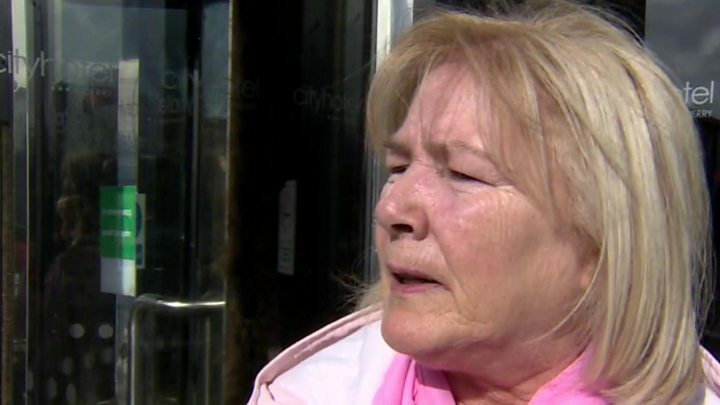 Media captionLinda Nash, whose brother William was killed on Bloody Sunday says: "We will keep going". "I'm feeling devastated. The most difficult thing I had to do today was to call my children and tell them that there are no prosecutions for their granda and uncle." Her sister Kate said they would appeal the decision. Soldier F gave evidence anonymously to the Saville Inquiry in 2003 and admitted firing 13 rounds on Bloody Sunday. His assertion that there were "gunmen and bombers killed" was rejected in Lord Saville's report. 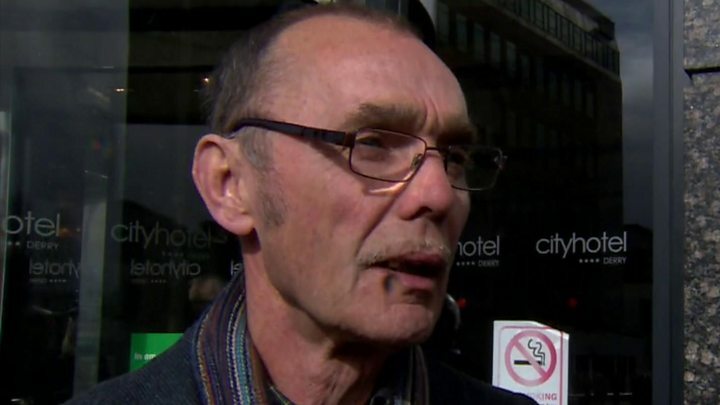 The Saville Inquiry stated that there was "no doubt" Soldier F had shot father-of-six Paddy Doherty, who was unarmed. Saville also found there was "no doubt" Soldier F had shot an unarmed Bernard McGuigan on Bloody Sunday as he went to the aid of Patrick Doherty, waving a white handkerchief. At the Saville Inquiry, Soldier F admitted he had shot 17-year-old Michael Kelly - but he said that he had only fired at people with bombs or weapons. However, Saville concluded Mr Kelly was unarmed. The Saville Inquiry found that both William McKinney and James Wray could have been shot by Soldier F and three other soldiers. The inquiry report also stated Soldier F had changed his story over the years. Mr Herron said the decisions to prosecute announced on Thursday "relate only to allegations of criminal conduct on Bloody Sunday itself". "Consideration will now be given to allegations of perjury in respect of those suspects reported by police," he said. Bloody Sunday might have happened 47 years ago, but it has cast a very long shadow, extending far beyond victims' families and those involved. It fuelled the Troubles and, two decades after they ended, it will once again throw a searchlight on how Northern Ireland deals with its past. Legacy issues, as they are termed, can poison the present day and they have been allowed to fester. Bloody Sunday has fed into the ongoing debate, with the government considering legislation as part of its next steps. Will that involve a de facto amnesty from prosecutions in future, and whom might that cover? This is the bigger picture against the backdrop of the Bloody Sunday decisions, significant as they are in their own right. The intention to charge a former soldier has clawed at emotions not just in Derry, but among bereaved families and victims in thousands of other Troubles cases left pondering truth and justice. The case could come before a court for a preliminary hearing quite quickly, says the legal expert, Joshua Rozenberg. He expects Soldier F to be brought before a court in Northern Ireland and to be named. UK Defence Secretary Gavin Williamson said the government would offer full legal support to Soldier F - including paying his legal costs and providing welfare support. "We are indebted to those soldiers who served with courage and distinction to bring peace to Northern Ireland," he said. "The welfare of our former service personnel is of the utmost importance." He said the the Ministry of Defence is working "to drive through a new package of safeguards to ensure our armed forces are not unfairly treated." "And the Government will urgently reform the system for dealing with legacy issues," he said. "Our serving and former personnel cannot live in constant fear of prosecution." Following Mr Williamson's statement, lawyers acting on behalf of the family of William Nash said they had contacted the Northern Ireland attorney general accusing the defence secretary of contempt of court. A public inquiry conducted by a senior judge in 1972 was branded a whitewash by victims' families. After decades of campaigning, a fresh inquiry was eventually ordered by then prime minister Tony Blair in 1998. Lord Saville's 5,000-page report stated none of the casualties was posing a threat of causing death or serious injury and that soldiers had lost their self-control. A police investigation into Bloody Sunday followed Lord Saville's 12-year, ? ?200m public inquiry. A file was sent to the Public Prosecution Service (PPS) in November 2016. In total, police reported 20 suspects to the PPS - 18 of them former soldiers, one of whom died last year. 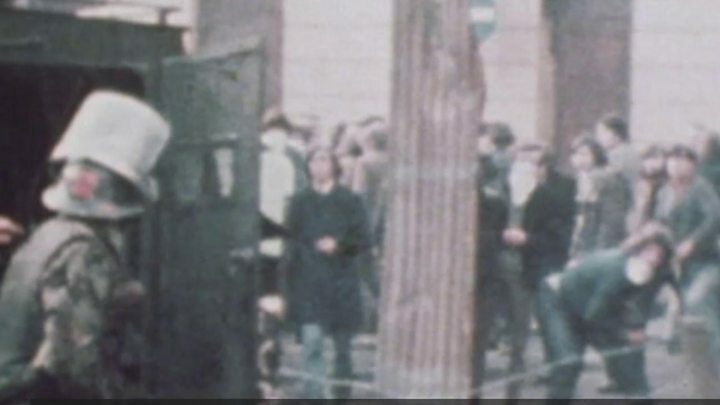 The march began shortly after 15:00 GMT on 30 January 1972, and the intended destination was the city centre. However, Army barricades blocked marchers. The majority of demonstrators were instead directed towards Free Derry Corner in the Bogside. After prolonged skirmishes between groups of youths and the Army, soldiers from the Parachute Regiment moved in to make arrests. Just before 16:00, stones were thrown and soldiers responded with rubber bullets, tear gas and water cannon. Two people were shot and wounded. At 16:07, paratroopers moved to arrest as many marchers as possible. At 16:10, soldiers began to open fire. According to Army evidence, 21 soldiers fired their weapons, discharging 108 live rounds between them.